If you’d like to read the balance of these particular pieces, I invite you to pick up your own copy of “IF ONLY THERE WAS MUSIC…” The Poetry of Forbidden Love on Amazon. I’d also like to invite you to follow this tour in its entirety as each day, at each stop, you will find more and more of these love songs without music, and even more reasons to fall in love with your lover, and Poetry, again. If you aren’t in love when you start reading this book, you will go seeking a love afterwards. Please visit my complete tour line-up HERE, and at each stop that you leave a comment (including this one), your name will be entered that number of times, into a random drawing for a $25 Amazon Gift Card!!! Thanks to my awesome host for today and thanks for stopping by, dear Guests. I hope to see you every day throughout this amazing tour to help keep Poetry alive!!! Always remember, that Love IS Poetry…they’re truly one in/and the same. 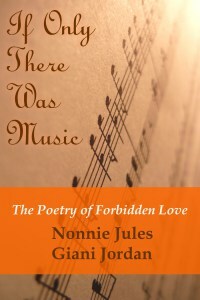 Although Poetry should be celebrated every day of the year, the month of April has been set aside specifically to lift it up, and so this is why Nonnie has embarked on this blog tour to keep it alive and bring awareness to the fact that Poetry is a great medium for release and expressions of all kinds.